Autodesk has just announced that through the end of July that AutoCAD 2000i users can upgrade to Au2005 at a reduced price. If you are still using AutoCAD 2000i and have not upgraded yet to AutoCAD 2005 now might be the time to do so. Also, if you are using AutoCAD R14, 2000 or another retird Autodesk product you might be eligible for the Legacy Upgrade program. Save up to 30% on the newest version of AutoCAD. If you are still using AutoCAD® Release 14, AutoCAD 2000, or another retired Autodesk® product, now is the time to make your move. Because for a limited time, you can save up to 30% on all replacement seats purchased with subscription! See how much more productive you’ll be with the newest Autodesk products . With the productivity-boosting tools in AutoCAD 2005 and the latest manufacturing products, you can eliminate tedious, repetitive tasks, and create, open, and revise drawings in a fraction of the time it takes now. Compatibility with more than 6 million Autodesk users worldwide. With AutoCAD 2005 and the latest manufacturing products, your drawings will be compatible with other Autodesk software users. And the built-in Autodesk® Batch Drawing Converter makes it easy to migrate all your old drawings. See your local Autodesk reseller for more information. For more information on AutoCAD 2005 go to the Autodesk.com web site. I have added some helpful links below. If you look at AutoCAD 2004 or 2005 you can only save a Drawing Template in the native format which would be AutoCAD 2004 file format. Well, this can cause problems when working in a mixed environment. So if you create a Drawing Template in AutoCAD 2004 or 2005 and still need users to access the file in AutoCAD 2002 maybe here is what you need to do. 1. 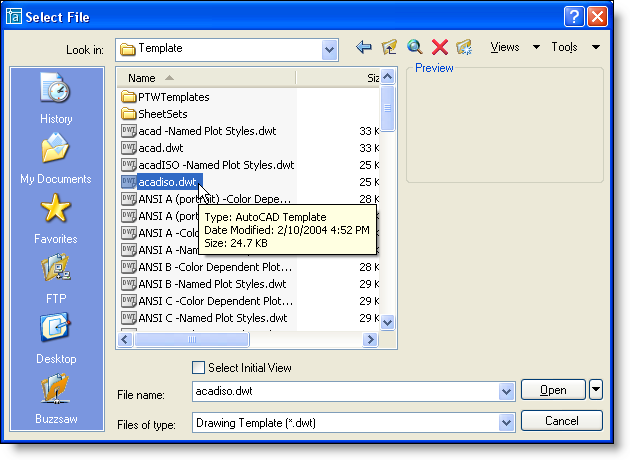 Open the Drawing Template up in AutoCAD 2004 or 2005. 2. Go into the SaveAs commond and change the file of type to "AutoCAD 2000/LT 2000 Drawing (*.dwg)". 3. Then in the file name field change .dwg to .dwt and click the Save button. You can confirm that the file has been resaved as a 2000 Drawing Template type opening it up. It will read "Opening an AutoCAD 2000 format file." in the Text Window. You can do the same thing by saveing it as a DWG file and then renaiming it in Windows Explorer, but then you have to start switching windows and can take a little bit long to complete the task then. Techsmith, the authors of SnagIt have just released version 7.1. Version 7.1 builds on the previous version of 7, which I have been using for my images on both my Blog and web site, among other things. The tool makes it very easy to capture screen shots with many forms of output. It has built in image editing capabilities eliminating the need for additional software. Shaan Hurly has a great summary of the changes that are new in version 7.1 on his Blog: Between the Lines. You can also find more about SnagIt and many of the other products that Techsmith makes at their website. Note: The Welcome Screen is only available if the computer is not part of a domain, but can be a part of a Workgroup. 1. Go to the start button and select Control Panel. 2. Click on the "User Accounts" category. 3. Click the "Change the way users log on or off" option. 4. Uncheck the "Use the Welcome screen" Option and click the "Apply options" button. 5. Restart the computer and you will not need to type in the User name and the password. As you might have already noticed the Layer dialog box has changed in AutoCAD 2005. It takes many of the things that were hidden in nested dialog boxes and brings them to the top. Not only did they redo the Layer dialog boxes, but they expanded the ability of the Layer Filter dialog box so it allows easier access and setup of Layer Filters. The left side of the Layer dialog box is where the Layer Filters are now at. AutoCAD by default now builds a layer filter for any Xrefs that are loaded into the drawing which makes the organization of Xrefs much nice in AutoCAD 2005. Tip: Select the Xref branch in the Layer Filter tree and then check the "Invert Filter" box in the lower left corner of the Layer Properties Manager you can supress the display of all the layers associated with an Xref that is in the drawing. Then check the "Apply to layers toolbar" box and click the OK button. Tip: You can display or hide the Layer Filter Tree by right-clicking over the Layer list and selecting the "Show Filter Tree" option at the top. This will give you more room if you are someone that doesn't like to see the Layer Filter Tree on screen. The Layer Filters are still available by right-clicking over the Layer list. If you right -click and go down to the Layer Filters selecttion, it will open up and display all the Layer Filters that are setup. 1. Launch the Layer Properties Manager dialog box by typing in the command "LAYER" at the command line or any of the other methods that you know. 2. Click the "New Property Filter" button located in the upper left corner of the Layer Properties Manager. 3. Provide a name for the Filter. This is the name that will appear in the Layer Filter Tree. 4. Change the other properties according to the types of Layers you want to appear in the Filter. The botton protion of the Layer Filter Properties dialog box gives you an idea of what the Layer Filter looks like in action so you don't have to go back and forth to see it in action. Name - You can type in a specific Layer name or use an '*' (asterick) or '?' (question mark) like in wild card searchs in Windows and DOS. 5. Move to the cursor to next line in the grid and repeat step 4 as many times as you need to. 6. Click the OK button to save the new Layer Filter. 7. Uncheck the "Invert Filter" box and select your new Layer Filter if it is not already selected. You should see the Layer listing change based on the Layer Filter. 8. Click OK to save and apply the Layer Filter. Tip: You can right-click over a Layer Filter to bring up a menu that allows you to change many of the properties like On/Off, Freeze/Thawed, Lock or Unlock for all the layers contained in the Filter. Tip: To delete multiple Layer Filters you can use the Control key to select more than one at a time or the Shift key to select a range of Layer Filters. Then right-click and select Delete ot press the Delete key on the keyboard. To select a range or Layer Filters select the first one that you want to select and then press and hold down the Shift key. While wholding down the shift key scroll down through the list and click the last one you want to highlight. This will select all the Filters in between the first and last on selected. Determine what bitcode is being used. Often, I am asked how you can tell if a specific Object Snap value (OSMODE) is set or determine the state of the Shortcut Menu (SHORTCUTMENU). These along with other values can be hard to tell at times because of the way the values are stored and summed up. These variables use bitcodes to determine what the behavior is going to be. Bitcodes can be summed up as a way to store many values as a single compact value that makes loading and reading them fast, for programs anyways. For someone to sit down and figure out the combinations of all the values it would take sometime and this is the reason behind the LOGAND and LOGIOR functions. The LOGAND function is much more useful that I have found than the LOGIOR function. Below is an example of a command that checks the OSMODE value to see if the INTersection object snap is set or not. If it is not on, it gets turned on and if it is on it gets turned off. AUGI just released their June issue of HotNews on their website. It has an article on Tool Palettes and much more. To view the issue you must be a memebr of AUGI which is a free membership. Click here to view the Customization Corner article on Tool Palettes. Click here to access the main page for the June issue. Did you ever think to yourself, why am I limited to downloading two files at a time when using Internet Explorer? Well, would you really want to download more than two files if you are using dial-up? Could this just be simply a setting that is based on the hardware and speed of accessing the Internet from a couple years ago? Very well could be, but there is a way to change it. Note: This tip is not for everyone and extreme caution should be exercised when attempting it. This is a tip involves using the Windows registry and there is no undo it something is done incorrectly. 1.) Click the Start button located near the bottom left corner of your task bar area. 4.) Navigate down through the branches starting at HKEY_CURRENT_USER and going through to Internet Settings. 5.) Right-click over Internet Settings and choose DWORD. 6.) Give the new key the name of MaxConnectionsPerServer. 7.) Double-click the new key or right-click over it and select Modify. 8.) Select Decimal as the Base and change the value to something like 5 or 10. 10.) Now you should be able to download more than two files at a time. This is a great way to download more drivers, patches and service packs in a short amount of time. I tried the tip with IE6 running under Windows 2000 and XP Pro/Home. I think the tip also works with IE5, but I haven’t tried it yet. AUGI just released their May/June release of AUGIWorld on their website. It has some great tips and tricks in the magazine for the release of AutoCAD and much more. To view the issue you must be a memebr of AUGI which is a free membership. Click here to view the Low Res version of the magazine (5.1 MB). Click here to view the High Res version of the magazine (33.3 MB). Often in our lives we must reflect where we have come from and where we are going. I have been a user and supporter of many releases of AutoCAD now. As many know or may not know I am a nut when it comes to AutoCAD. The AutoCAD Past, Present and ... is a way that I can share some of my past knowledge of AutoCAD with others. I have started and image gallery of what AutoCAD looked like starting back in R12 for Windows through AutoCAD 2005, and no, I don't have R12 for DOS installed either. I started with R12 for DOS and it was a great release back then and I went to Windows R13 from there which was an interesting release I must say. R13/14 was when I first started programming on top of AutoCAD with LISP and most of the other forms of general customization. I started using VBA in R14 when it was a seperate install and was hooked from there. Once I learned VBA I moved to ObjectARX development for both R14 and 2000. Anyways, I hope you enjoy the pictures. I will upload more as time goes on. For some other AutoCAD History, visit Shaan Hurley's AutoCAD History pages.... great information of past releases of AutoCAD.